It is said about film-makers The Ramsay Brothers that they were Bollywood's prime exponents of low-grade, sleazy 1980s horror cinema. Similarly, Bappi Lahiri's music is often described as the epitome of tacky Bollywood disco. It makes sense then, that they would work together regularly. To Bappi’s credit, his scores were often far more sophisticated sounding than the pairing might suggest. 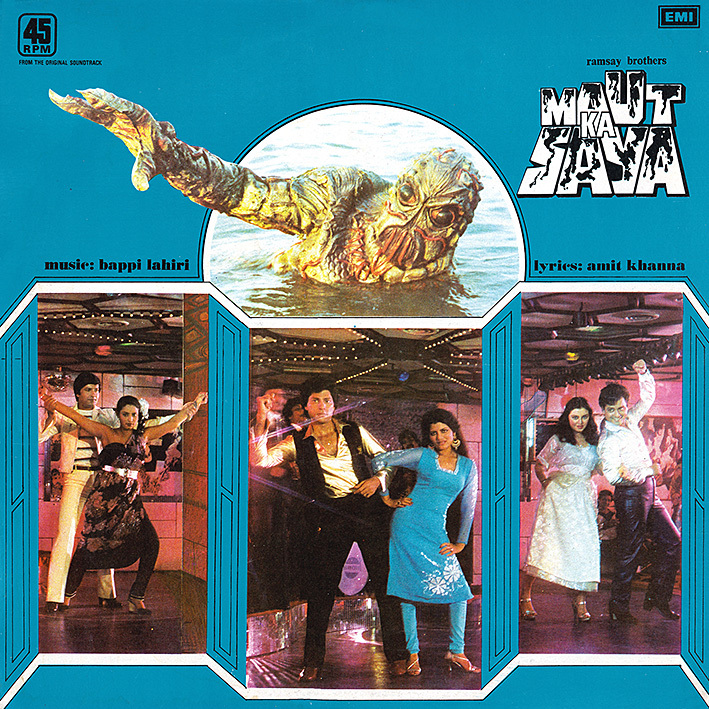 And unlike its appealingly schizophrenic cover, there's not much musically on the soundtrack to 'Maut Ka Saya' that actually suggests horror. Predictably, the out-and-out dancefloor tracks take centre stage. 'Aafat' is a rousing anthem performed by Bappi regular Annette Pinto and the composer himself, and 'Dance Music' is a percussive jazz dance number enhanced by teasing giggles and sighs. Both are great, but I'm actually even more fond of two of the album's non-disco tracks. 'Yeh Samundar' fuses flamenco with electro and again features Annette in addition to a series of wonderfully exotic solos, while 'Zulfon Tale' is mellow Caribbean flavoured lounge pop, accordion-led with sensuous vibraphone interludes. Shailendra Singh does the honours on this one. Unusually, there doesn't seem to be a single song clip from this film on YouTube. This movie was never released thats why there arent any clips on youtube! !But thanks for this album. Didn't know that, thanks for the info. Any idea why it remained on the shelf? Not sure at all.Was looking forward to seeing it at that time.Still remember having this lp.You got a great collection of lps.Reminds me of my collection. Thanks. Yeah, just based on the soundtrack's cover art I'd have wanted to see it too!